<!-Eric Gill. 1882-1940--> Eric Gill. 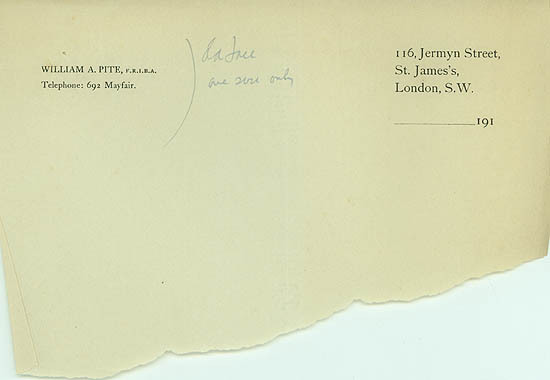 Letterhead for William A. Pite, F.R.I.B.A, 116 Jermyn Street, St. James's, London - S.W..
Letterhead for William A. Pite, F.R.I.B.A, 116 Jermyn Street, St. James's, London - S.W. 4 1/16x 8 1/8 (irregular trimmed margins). Printed on Royal Bond paper. Pencil annotations by Gill, 'dalou one size only'. Unsigned. $175.